Ecoplug Max Tree Stump Killer Drill Bit is our own design for ecoplug max tree stump killer drill bit. The Ecoplug Max Drill bit is ideal for getting the perfect depth for using Ecoplugs, the Ecoplug drill bit has a stop plate at 30mm allowing precise depth control. 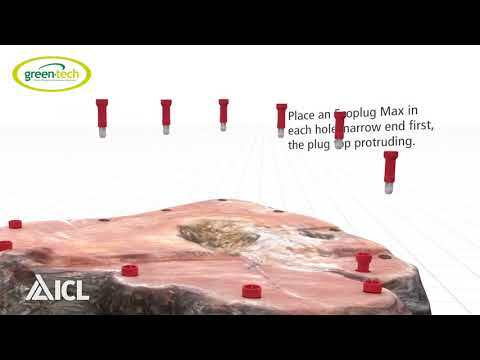 Ecoplug Max Tree Stump Killer is a tree stump technique releasing glyphosate for the treatment of stumps to minimise root and stump sprouting. Ecoplugs are a unique product that is designed to minimise operator hazards and provide a safe alternative to painting cut stumps with a liquid solution. How to Apply Ecoplug Max Tree Stump Killer Using this Drill Bit Step 1: Cut the tree as close to the ground as possible. Step 2: Drill 25-30mm deep & 13mm wide using the Ecoplug drill bit to control the depth (the Ecoplug drill bit has a stop plate at 30mm allowing precise depth control). Step 3: Place an Ecoplug in the hole with the orange end first. The top will protrude by about 10mm. Step 4: Hit the Ecoplug with a hammer until the head is flush with the stump to push out the sides & release herbicide.